We own all the homes offered on this website. You are dealing direct with the owner, not some agent. Our Las Gaviotas vacation rentals in Rosarito Beach have beach-facing patios with spectacular white-water ocean views - perfect for a day of basking in the sun or for a quiet evening meal beginning with a breathtaking sunset. From the moment you enter the gates you can sense why hundreds of visitors return every year and enjoy us 'doing the unexpected' for them. 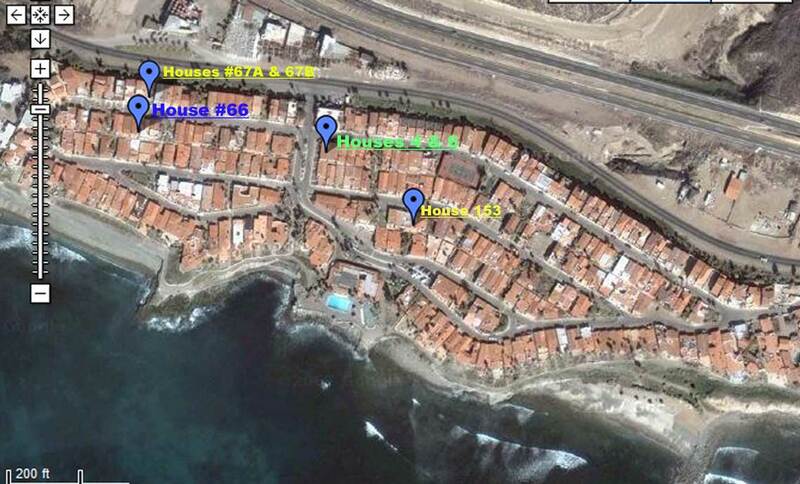 Las Gaviotas is a gated resort community located eight miles south from the city of Rosarito Beach. Las Gaviotas is a residential community without street hawkers and beggars. Inside the walls, peace and quiet are strictly maintained for the enjoyment of all. All homes are individually owned. Only Las Gaviotas guests and owners can use the private beach, huge swimming pool, Jacuzzi, tennis court, shuffleboard and playground. Las Gaviotas is also a surfing destination. At Las Gaviotas, you are secure with the gated entrance and hourly, walking police patrols. A team of full-time groundskeepers display their pride with garden areas of flowers and bougainvillea that spill over flagstone paths leading to the ocean. Be captivated by the seasonal appearance of migrating California grey whales, schools of dolphin, and hundreds of pelicans and swallows. Indulge yourself and relax with the mild, year-round climate, clean air, fresh ocean breezes and warm sunshine. You may choose private walks, relaxing evening swims, a dip in the Jacuzzi or the nightlife of Puerto Nuevo lobster village, one mile south. Ten minutes north are Papas & Beers, Rock n Roll Taco and Senor Frogs nightclubs in Rosarito Beach. We are 45 minutes from Ensenada and Hussong's.